When I first started metalwork, Lexi told me that I would find my color pallet and that would come from my stone choices. On my first shopping adventure with her at the Denver Gem & Mineral Show, a few of my first stone selections were these beautiful dendritic opals. At the time, I didn’t understand why I was drawn to this stone type, nor why the black and white contrast was so appealing to me. However, I am starting to understand that it’s the tree shapes that those black dendrites form in the stone….that’s what calls to me….that’s what entices me to create pieces with natural lines….that’s what makes a statement of ‘simple, yet elegant’. How beautiful is this stone? It reminds me of a winter scene, as most of these do. Since we just experienced a fresh snow Wednesday night and throughout the day on Thursday, it seemed that Fresh was the perfect title for this piece. Another piece that has recently been added to my Treescape collection. 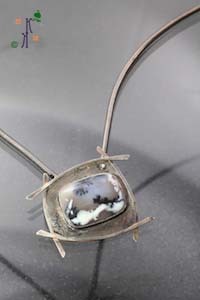 Set in Sterling silver and oxidized to set the backdrop for a true work of art, the dendritic opal stone, created in nature. If it calls to you as it did to me, let me know. It’s available to find its new home.